Your bathroom may be limited on square feet, but that doesn’t mean it still can’t make a big statement. In fact, there are plenty of ways you can create an amazing and eye-catching space, even within a fairly tight area. With enough creativity and some ingenuity and out-of-the-box thinking, the possibilities can be quite vast. Obviously, there are some options that are just not realistic when the room is on the smaller side—you can probably forget about mammoth vanities or other space-hogging furnishings. But there are many other tactics that can allow you to design a stunning bathroom that can outshine spaces several times its size. Fool the eye to make the room seem more spacious. Optical illusions are one of the favorite tactics used by designers who want to make a room appear to be more expansive than it really is. There are a number of tricks that can work well in achieving this goal of fooling the eye. Mirrors and reflective elements can provide an enlarging effect on the look of the space. Don’t just focus on making the room feel wider. If the bathroom is narrow, you can also create a sense of more space by directing the eye upward, which can be achieved by using tall cabinetry or by placing eye-catching details on high shelves or near the top of the walls. Using bolder colors or attention-grabbing designs in the higher parts of the room can also do the trick. An attractive chandelier is another effective way to draw attention to the upper reaches of the room. Colors can play a major role, as they greatly influence the look and feel of any space. Lighter colors can invoke the sense of a more open and airy room, and a monochromatic design scheme also helps the eye flow across the room, making it seem more spacious. In addition, white or light colors can reflect natural light, which in turn helps the space look brighter and bigger. This isn’t to say you must avoid colors at all costs. Rich, darker shades can give the room a warm and cozy feel, so that may be a good choice if that’s the mood you are hoping to achieve. And remember, even if you do want to stick with lighter shades, there are lots of options of pale shades across the color spectrum, so you may want to consider a lighter shade of blue or green. Strategically placed or designed lighting can also assist with a visual illusion, disguising the compact layout of the room. This can be particularly helpful in situations where the room doesn’t have a lot of windows or receives little natural light. If you are going with a neutral or understated basic color scheme, you can add a pop of color or personality by choosing unusual hardware elements. This is a great way to add an eye-catching element in an affordable way and one that doesn’t take up any extra space. Enclosed or separated areas will only add to a confined feeling, so consider using open elements such as a pedestal sink or glass shower to make the room feel less compartmentalized. And it probably goes without saying that you should keep clutter to a minimum, as more stuff will only make the place seem more cramped. If your goal isn’t so much to visually expand the space but more to just make a strong statement, you have plenty of options. Bold colors or vibrant, stunning patterns are one option that can be achieved at virtually any budget. Likewise, you can choose unusual fixtures or exotic materials to break out of the typical mold. Graphic patterns tend to make a statement and can be selected to reflect your own style. Be careful to avoid going overboard, though. It’s often wise to balance out a bold color or graphic design by choosing understated options for other elements of the space. Choosing even just one statement piece like a custom-designed cabinet or a rare decorative item can often have a powerful impact. It’s even better if you can manage to find something that is truly representative of your individual style or has a personal significance. An item that represents the culture or style of a place you have visited, for example, conveys the sense of a place that is uniquely yours. Unconventional or creative layout and design choices can also be an effective way to achieve a space that doesn’t follow a cookie cutter approach. Consider ways that you can arrange things in an unexpected or interesting way. RW Remodeling has created amazing bathroom designs in spaces of all sizes. 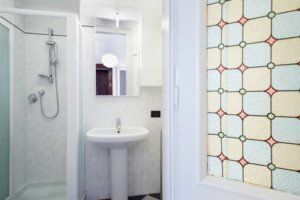 We can suggest plenty of great ideas for remodeling small bathrooms that can help you achieve that stunning and unique look you want.